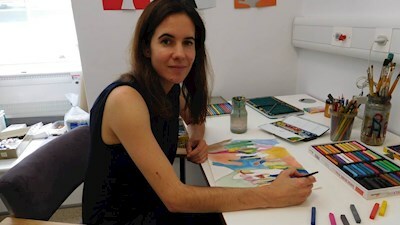 With our funding, patients with cancer at St Bartholomew’s Hospital – part of Barts Health NHS Trust – are benefitting from art therapy sessions to reduce feelings of anxiety. Art therapy can be a powerful tool for this, as well as expressing feelings. This new £15,302 project will expand the existing service, aiming to improve patient wellbeing. A new art therapist is working with patients on the chemotherapy and radiotherapy wards, spending time chatting with patients and exploring whether they’d like to take part in an art therapy session. “We’re exploring whether it’s the psychological support element [talking with the therapist] or the artistic expression – or a combination – that underlies the benefit. More hospitals further afield are considering how they can implement art therapy into existing services, meaning these results will be important in showing the possible benefits of art therapy. “Talking with a therapist about my illness was helpful and the artwork itself was relaxing and therapeutic which surprised me”, one said. After suffering a stroke, many patients lose language skills. We’re helping them with a project exploring whether common technology can be used to recover language and communication skills.